A cold, April day found us in Hershey, Pennsylvania. Everybody knows Hershey’s Chocolate. 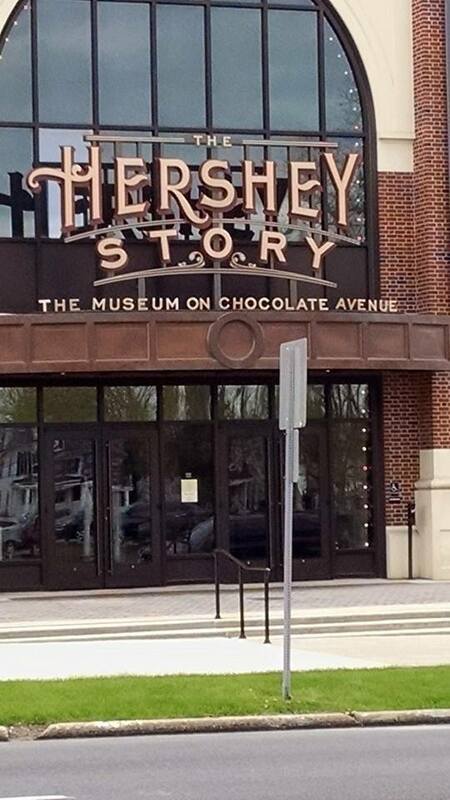 We had just a few hours to spend, so we took in The Hershey Story. It’s a beautifully built building that hosts the history of Hershey Chocolates. From the start in the late 1800’s to it’s rise during the depression, Hershey wanted to be the chocolate company for everyone. They altered their production methods to be able to provide candy at a low cost for all. The displays are well curated, providing an opportunity to see actual equipment that was used in the early years. An interactive display provides you the opportunity to apply for employment at Hershey in the early 1920’s. I got a job in the Wrapping Department at $0.10 per 5 pound box of wrapped Kisses; my husband was able to procure a job in the Roasting Department at $0.15/hr. That’s a far cry from union wages. But really, all was fun and games, all the advertisements Hershey was famous for was on display, as well as lots of information about the family and how the community grew up around the Hershey factory. It’s worth a stop as you are driving through, but probably not a destination location unless you are taking in all the eastern Pennsylvania has to offer, or a trip to the Amusement Park is on the agenda.